The campaign against FGM in the Middle East & Asia started in 2013. Our first aim was to get the message out that female genital mutilation (FGM) exists not only in Africa, but also in many countries in the Middle East and Asia. This goal we have reached – at least partly. UNICEF has finally recognized FGM as a problem beyond Africa in Febuary 2016. However, not in all countries where it is prevalent. We keep on working for this goal. 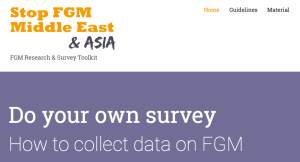 As we realize that one important step in this process is to produce data, we have created a survey tool-kit to help individuals and groups create their own small-scale surveys on FGM. Our experience has been that only scientific proof of the prevalence of FGM can move decision makers to recognize the problem. Our second goal was to bring together activists against FGM from different Asian countries and support their activities. A network of activists from Oman, Saudi Arabia, Iraq, Iran, India, Malaysia, Singapore and Indonesia has been formed. We are able to support a number of small activities in different countries. Today, no one can ignore the fact that FGM exists in Asia anymore. It still happens that someone says: „Oh, but female genital mutilation, that is an African practice.“ But it doesn’t happen all the time anymore. Most media reports on female genital mutilation (FGM) today state that it exists in Africa and the Middle East. And quite a few mention Southeast Asia. Several non-governmental organizations working on FGM have changed their maps highlighting countries in Asia where the practice is common. The United Nations are aware of it and are planning to conduct large scale studies: Questions about FGM will be included in regular domestic household surveys or MICS (multiple indicator cluster survey), the first new place where this will happen is Oman. Three years ago, it looked quite different. When the campaign “Stop FGM Middle East” started working in the summer of 2013 it was still met with disbelief and misunderstanding: Middle East? Oh, you mean Egypt. Ten years ago, the Iraqi-German NGO Wadi and co-founder of the Stop FGM Middle East campaign, started a campaign against FGM in the Kurdish region of Iraq. While it is always difficult to convince people who defend a tradition, it turned out that it could be just as difficult to convince the international community that a problem exists where no one expected it. But we also knew that change is possible. Today, the practice has been outlawed in Northern Iraq, an awareness campaign by WADI is supported by the Kurdish Regional Government and Unicef. FGM rates have been dropping rapidly in regions targeted by the campaign. In other countries in the Middle East and Asia, the struggle against FGM is still at a starting point. Through continuous research we can draw a vast map now including Iraq, Iran, Pakistan, India, the Maledives, Sri Lanka, Malaysia, Thailand, Indonesia, the Philippines, Oman, the U.A.E. One of the campaign’s focal points since the start has been religion. While FGM is not related to religion everywhere it exists, all evidence in Asia points to a strong connection between Islam and FGM. We realized early on that it is essential for any campaign against FGM to discuss religion and to find religious leaders who correct the assumption of FGM as an Islamic duty or recommended practice. Therefore we collect Fatwas against FGM. — or directly here via betterplace – the donation will be transferred to us without any fees.